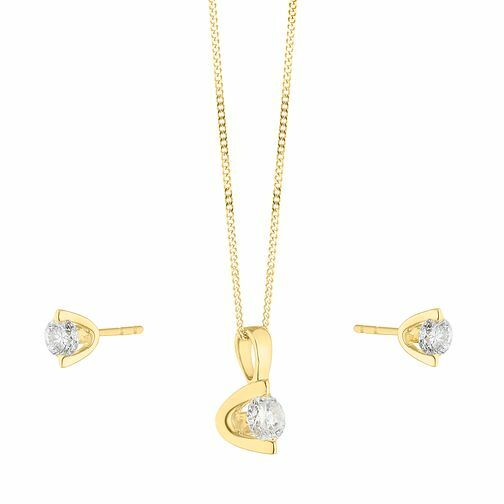 This gloriously glistening set features co-ordinating stud earrings and pendant, made from 9ct yellow gold for a stunning finish. A fine yellow gold chain leads to a drop marquis pendant embellished with a shimmering round diamond. The stunning stud earrings feature the yellow gold marquis design complete with diamond centers. A timeless set, perfect for gifting. 9ct Yellow Gold 1/2ct Diamond Earring & Pendant Set is rated 3.5 out of 5 by 2. Rated 5 out of 5 by Anonymous from My Fiance Loved them My Fiance was blown away by the earrings and necklace. We don't usually buy online, however the price was too good to refuse. We went to a shop to collect and we were both very happy with the purchase. They were as dainty as we thought they were going to be. Would highly recommend.